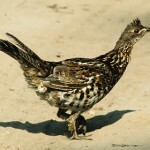 Description: A stocky, brown grouse, considered a large “chicken-like” bird. It is heavily barred with paler stripes above and grayish brown below. Has a short tail. The male has yellow-orange air sacs inflated during courtship display, and long feathers on sides of the neck that errect into “horns” during courtship; females have “horns” but they are shorter. Both male and female have obvious dark eye-stripe and pale throats. When in flight, the wings are rounded and the flight is swift with a series of rapidly beating wings. Behavior: Multiple males display for females at a group display site, called a lek. They perform striking courtship dances where they strut about and stamp their feet, with “horns” erect and yellow-orange sacs of skin inflated on the sides of the neck, meanwhile uttering a deep cooing call referred to as “booming” that may be heard a mile away. They leap and whirl in the air, and threaten each other by short runs with tail raised, head down, and horns erect. food: Leaves, seeds, buds, cultivated grains, fruits, and insects. Habitiat: Greater Prairie-Chickens require undisturbed prairie, preferring open sweeps of permanent high grass and minimal brush and trees. 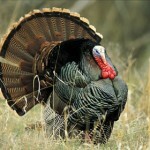 It uses vegetation 10-18 inches in height for roosting and nesting. Hens avoid nesting or rearing their broods within a quarter-mile of powerlines and within a third-mile of improved roads. 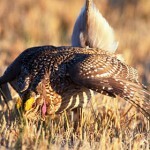 In eastern Nebraska, the Greater Prairie-Chicken is heavily dependent on CRP grasslands. conservation status: G4: globally apparently secure; S3-S4: state vulnerable to apparently secure; NBP Priority Species, NNLP Tier 1 Populations are probably declining throughout the Plains states. 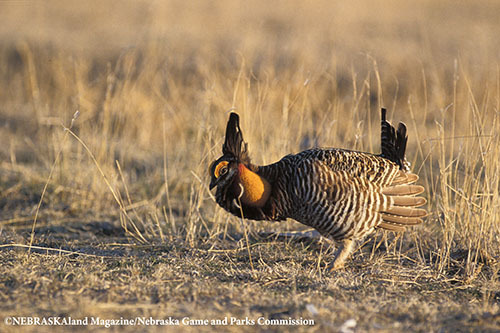 Greater Prairie Chicken is a Nebraska Bird Partnership priority species for conservation. Fun Facts: Greater Prairie-chickens use a lek-mating system, where the males defend and dance on a territory that holds no valuable resources to attract females.